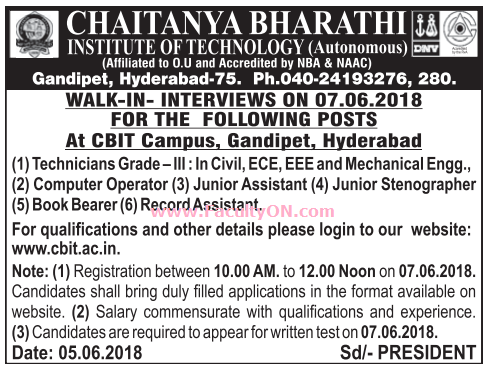 Chaitanya Bharathi Institute of Technology, Hyderabad has advertised in the EENADU newspaper for recruitment of Non-Teaching Faculty jobs vacancies. Interested and eligible job aspirants are requested to walk-in on 07th June 2018. Check out further more details below. About College: Chaitanya Bharathi Institute of Technology is one of the premier Engineering Colleges in the self-financing category in Andhra Pradesh. It has been accredited twice in 1998 and again in 2004 by NBA(AICTE). It is also the first ISO 9001-2000 certified Engineering Institute of AP. The total constructed area is 4,45,467 sq. ft. worth about Rs 25..00 crores spread on 30 acres. The grants recieved from AICTE are worth about Rs. 1.3 crores. The college offers 9 UG and 7 PG coureses. How to Apply: Interested and eligible candidates are requested to appear for Walk-in interview with duly filled application form (can be downloaded from college website) along with originals & one set of copies of certificates, PAN card, Aadhaar card and PP size photos to the walk-in address given below.